A combination smart-card reader and fingerprint sensor strengthens biometric authentication in the $159 5th Sense Combo Peripheral from Veridicom Inc.
Biometric authentication aims to replace passwords for access to data, computer systems and digital certificates. The 5th Sense biometric device authenticates a user's fingerprint and can offload the processing from the host to its smart card. Veridicom of Santa Clara, Calif., uses a silicon sensor chip and has been making its own standalone fingerprint authentication device for about a year, said president and chief executive officer Mike D'Amour. The sensor's 77 capacitors capture a 90K image of the user's fingerprint, then extract identifying data from the print into a 300-byte template that is stored for reference during authentication. The 5th Sense smart card can store the template as well as offload the comparison processing from the host computer. 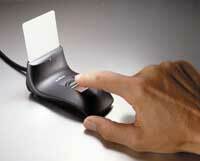 The Veridicom peripheral measures 4.25 inches by 3.75 inches. It connects to the host via a Universal Serial Bus or parallel port connector. Log-in and encryption software plus single sign-on software for unlocking multiple passwords are included with the peripheral. A smaller, more efficient version of the company's sensor chip will arrive next year for built-in authentication in keyboards, notebook computers, wireless phones and Internet appliances. Such chips will cost about $39 each in 1,000-unit quantities.